A friend wrote to say that he received his pre-order copy of my new book on Bahrain (and to a lesser extent the Arab Gulf generally), and it reminded me that I haven't really dedicated a full blog post to it. Obviously, I'm not going to go on and on about how great it is; mainly I want to inform readers that the 20% pre-order discount on Amazon is still available until the official publication date of June 8, even though (apparently) it is already shipping. Or you could always wait six months or so until people are selling used copies for 99 cents or whatever. 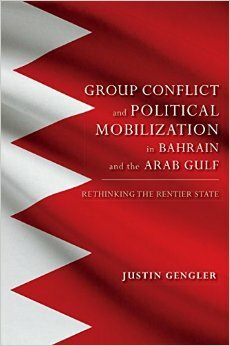 The book is titled Group Conflict and Political Mobilization in Bahrain and the Arab Gulf: Rethinking the Rentier State. Not such a catchy title, right? Despite that, it is being published in the Indiana University Press Series in Middle East Studies, and we've already reached an agreement with another publisher for an Arabic translation. But I don't have a clear sense yet how long the latter will take. The book draws upon my doctoral fieldwork in Bahrain, including the results of my mass political survey administered in 2009. But the revision schedule was such as to allow historical analysis up through the 2014 parliamentary elections. So it's actually quite current. Analytically, the book attempts to understand the conditions under which the presumed "rentier bargain" -- rent-funded economic benefits for citizens in return for political loyalty or apathy for the state -- fails to operate, or operates among some citizens and not others. In doing so, it examines the political motivations of ordinary Gulf (mostly Bahraini) citizens as well as specific strategies of rule adopted by Gulf states. Hopefully people will find it interesting. I will be sure to get it on my Kindle when it finally reaches Israel. I've been enjoying your blog for many years now and read your PhD thesis too, so this will be very interesting, I'm sure.